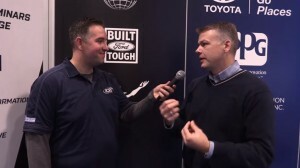 Interactions with shops have given Ford and Toyota some insight into how closely collision repairers are following OEM procedures and using OEM parts, respectively, automaker auto body staffers said in new SCRS-Collision Hub videos. A year and a SEMA after the aluminum 2015 Ford F-150 rolled out to dealerships, Ford collision marketing manager Mark Mandl said auto body professionals are starting to get a better handle on what fixing the vehicle is and isn’t. Mandl said his company stresses consulting the OEM manual/repair procedures every time you step up to a Ford vehicle to not only mechanical repairers and dealer service centers, but also dealership and independent auto body shops. “There’s always gonna be continuous evolution,” he said. Collision avoidance technology — “our responsibility” — really makes shop parts choice a concern for Toyota, Leos said. Like Mandl, Leos also supported following OEM procedures — “the only way” to do a repair — and spoke to the value of repairer education.